Chinese Internet titan Tencent has opened another four cloud data centers - two in the US, one in India and one in Hong Kong. In an effort to compete with the likes of Amazon Web Services (AWS), Microsoft Azure and Alibaba Cloud, the company has targeted key data center metro markets: Silicon Valley, Virginia, Mumbai and Hong Kong, ramping its overall data center count up to 42. Tencent already offers cloud services hosted in the US, having made its entrance in Silicon Valley last year. A new facility in Virginia places the company at the heart of the world’s most dense data center and interconnection market. As for the new site in Hong Kong, where Tencent brought its first data center online last year, the company says it will exclusively serve the financial sector. The facility in Mumbai is Tencent’s first in India, where there is plenty of room for growth, as the country’s economy becomes increasingly reliant on digital services. Chinese rival Alibaba Cloud launched its first local data center in Mumbai in January. The next step for Tencent is to roll out new facilities in Thailand, Russia and Japan. 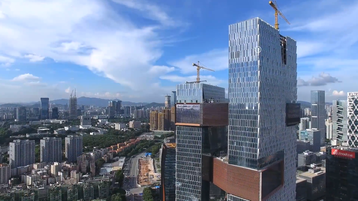 Earlier this year, the company opened a new data center in Chongqing, southwest China, to serve local manufacturing operations, as well as to enable the use of its WeChat social media application for administrative purposes, such as passport and marriage registrations, birth registrations and more.